Property 5: The Hen House - Book a little break away now! Property 6: The perfect location - Right On The Beach! Property 8: Coastal Views are the order of the day! Property 9: Beachfront - In Paradise! Property 10: Summer's here! Grab a short break here now! 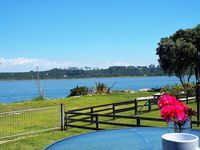 Property 11: Perfect Kiwiana getaway - for the WHOLE family! Property 12: Barefoot Manor - right on the beach! Property 15: Stunning Ocean Views from this Pukehina Paradise! Get in quick, always goes fast! Book Now! Property 19: Get in quick, always goes fast! Book Now! ACCOMMODATE OVER 2O - ABSOLUTE OCEAN FRONT. Property 20: ACCOMMODATE OVER 2O - ABSOLUTE OCEAN FRONT. Perfect location, 1 bedroom studio. Property 21: Perfect location, 1 bedroom studio. Couples retreat with panoramic views from bedroom. Property 22: Couples retreat with panoramic views from bedroom. Available Now for your short summer break! Property 26: Available Now for your short summer break! Property 30: Best view on the beach! Property 34: Wow! The Lookout on Pukehina has THE best views! Property 38: Does your dog enjoy the beach? Bring him here! Property 40: Newly renovated and GORGEOUS! Summer's still here! Property 42: Come and enjoy the rest of summer at the this Haven! Property 43: Beachside Bliss at Maketu. Property 47: MAKETU SEA MAGIC "BACH RETREAT"